Finely dice onion and garlic and place all the ingredients except chicken into a lidded casserole dish and mix well. Add the chicken ensuring its covered by the sauce and place in the oven at 160c for about 1.5 hours dependent on chicken size. (Check that the chicken is fully cooked through with a skewer). Serves 4 people when served with couscous or turmeric flavoured rice and flat breads. 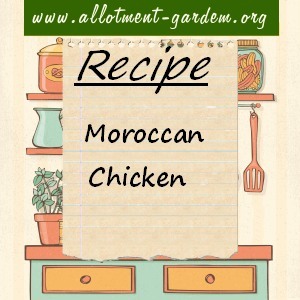 I’ve also use boned and skinless chicken thighs or diced lamb with this recipe. It’s best to brown these of in a dry frying pan to release the fats prior to casseroling.